Kate is a sculptor and photographer who creates visual social commentary using themes and symbolism from history and mythology, micro and macro viewpoints. She utilizes welded and laser-cut metal, acrylic, glass, wood, mirror, sound and light to shape her designs into interactive enveloping environments that are given more meaning with each visitor’s participation. 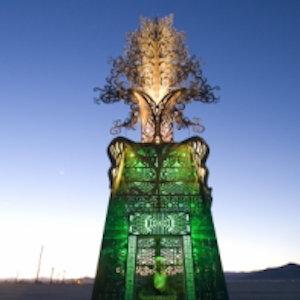 Her sculpture is in the permanent collection of the Nevada Museum of Art and includes publicly and privately commissioned works for Burning Man, The Reno Arts and Culture Commission, the Black Rock Arts Foundation, and the All Points West Music Festival. Her photography clients include Mtv, Citigroup, Atlantic Records, Nike, and Continental Airlines. She is published in the New York Times, The Village Voice, The Washington Post, Time Magazine, Billboard Magazine, High Times, and more. Kate has served as the staff photographer for The Kennedy Center for the Performing Arts as well as the Public Theater.